Keith Hodan | Trib Total MediaStudents in Reuben Clark’s Introduction and Evolution of Games class, including Landin O’Neil, 17, a senior, left, and Tyler Vescio, 17, use their laptops to design games during the class at North Hills Senior High, Tuesday, Sept. 22, 2015. Wednesday, Sept. 30, 2015, 9:00 p.m.
Shannon Heinl has been interested in games for awhile, but this was the first year she’s been able to learn how to build one in school. The North Hills High School senior is taking “Evolution of Games,” part of a curriculum the district implemented this year to teach students about the history of gaming and how to design their own games using 3D imaging and printing and laser engraving. Heinl hopes to be a video game animator. She’s already taken a 3D animation class at North Hills and hopes the gaming curriculum will prepare her for her career, and attract more girls to gaming and technology courses. “It’s kind of expanded, so more girls are interested in this, too,” Heinl said. 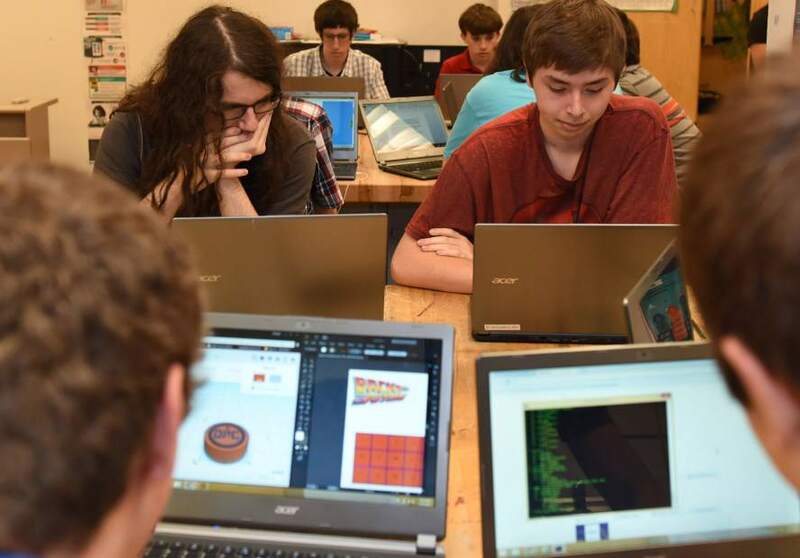 Nearly 200 students are enrolled in the classes at North Hills; there are five sections on the Evolution of Games, two on mobile game design and one on game design. The school hopes to expand its offerings each year to eventually include game production and marketing, game maker programming and screenwriting. There are 11 total courses in the program. The courses have been a great gateway to students who normally wouldn’t consider technical education classes, said Reuben Clark, a technical education teacher at North Hills who teaches the gaming classes.